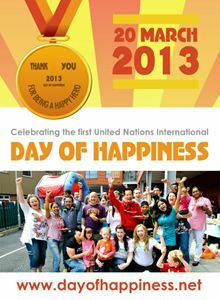 Happy International Happiness Day. The UN has decreed that the globe will be happy today. It has decided that a nation’s happiness will no longer be decided by its success or power but by the compassion and wellbeing of its people. But I think happiness is more personal and a subtle than a group hug that wraps its arms around the globe. It’s an initiative to applaud, but each person’s happiness is surely individual? How do you define happiness? By reaching out to help someone? By having more meaning in your life? By spending time with loved ones? Or are you seeking that elusive happiness through work, relationships, money, belongings and status symbols? Action for Happiness – “a movement for positive social change” – helpfully provides 10 keys to happier living. It also says that happiness comes from being grateful for what you’ve got rather than looking to all the things you’re living without. It says that “people who are grateful tend to be happier, healthier and more fulfilled”. So perhaps today is for a day for counting our blessings. In the words of Oscar Wilde’s Dorian Gray, perhaps we can appreciate “the moments of life that is itslef but a moment”.